USL = NCAA: The theme of this year’s new Steel signings is other teams’ draft picks. Only one such signing is not, new striker Brandon Allen from Georgetown who turned pro as a homegrown with New York Red Bulls . Omar Holness of UNC-Chapel Hill was Real Salt Lake’s 2016 number 1 pick, 5th overall. Brandon Aubrey from Notre Dame was Toronto FC’s number 1 in 2017, 21st overall. Drew Skundrich from Stanford was the LA Galaxy’s number 2 pick this year, 40th overall. A. J. Paterson from Wright State was NYCFC’s number 2 pick this year, 42nd overall. The Union’s two surviving 2018 draft picks, 54th and 55th overall from round 3, have both signed with the Steel. They are Mike Catalano, a central midfielder from Wisconsin, and Aidan Apodaca, a striker from division 2 California Baptist. It seems the NCAA leads to the USL according to the Union. Rehab update: Omar Holness began technical drills with the team last week. He might be ready for competitive drills soon. He will then need time to increase his load step-by-step. A few days ago coach Burke thought he was about a month away from full availability, contingent on conditioning. Construction Zone: Central defense, and therefore the defense in general, has to be rebuilt because Auston Trusty and Hugh Roberts are both gone, Trusty to the Union and Roberts to Pittsburgh. Keeper seems set with Jake McGuire, Tomas Romero and Kris Shakes. New center-backs must be found. Aubrey will start. Paterson will cover for starter Mark McKenzie when away on youth national team duty as he learns a new position. Right back will be known veteran Matt Mahoney. Left back will be Matt Real backed by Prosper Chiluya. General defensive depth comes from academy player Mike Pellegrino, and new arrival Drew Skundrich. The offense should be strong. The flank mids are returning veterans, the defensive center mid “makes us click” according to Burke, the attacking center mids have shown repeated promise. Striker has depth and tactical flexibility. Center mid is unproven in this organization, but may be three deep and is promising. Two position competitions are, or will be, occurring within the offense, between Mike Catalano and Omar Holness at center mid, and between Brandon Allen and Aidan Apodaca at striker. If competitors turn out to be starting-caliber USL players, coach Burke is likely to adapt to that in some fashion. The season-determining questions involve the center back rebuild. Will Aubrey display enough speed and savvy to protect against breakaways while playing the organization’s high-pressure, high restraining line? Can Paterson quickly learn his new role well? Will McKenzie stay healthy for the full season? Will all the team’s newcomers grow as much and as quickly as did Mahoney last year? Were all four questions to be answered “yes”, then the Steel should compete to be a visiting team in the playoffs’ first round. The elephant in the room is whether for a third year running the Steel can avoid catastrophic injury. To call their roster thin is to say that during his emaciated period the Buddha was not overly plump. The eastern conference will be stronger this season than last through both addition and subtraction. 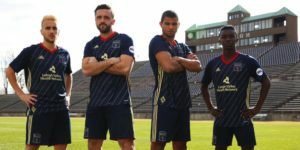 Two USL east newcomers have fled the NASL, North Carolina FC and Indy Eleven. They will compete well. Atlanta 2 is an expansion side, but it has Carlos Bocanegra overseeing it, Arthur Blank financing it, and Atlanta’s academy feeding into it. Expansion side Nashville lacks the Atlanta track record, but by qualitative description they seem comparable on all major points. Bob Lilley has moved to Pittsburgh and has combined the best of the old Riverhounds with many of his best old Rhinos. NASL’s death makes good NASL players available to fill any holes. 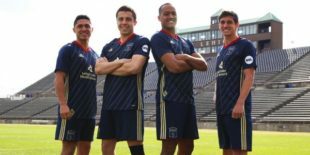 Bethlehem now has stiff competition to be the best USL team in the Keystone State. The Ottawa Fury say they have re-oriented away from their old bunker, counter, and set piece approach to a possession game under Swope Park Rangers’ old coach who made the last two USL Cups. Reboot Penn FC will be unknown, but they looked disciplined and effective with most of their A group in an earlier preseason half. Weaker sister Orlando City B is on hiatus. So is playoff perennial Rochester. Charlotte lost repeated MVP candidate Enzo Martinez to MLS’s Colorado. In 2016 without him due to injury they were a distinctly lesser side. The rest of the east’s usual suspects remain themselves, the strong, the middling, and the weak. This year there are 16 teams after 8 eastern playoff spots, not 15 as last year, and more of the 16 are better. Last season’s Steel won the conference’s final playoff spot in an extremely tight race. Their USL roster seems stronger with its emphasis on second chances for high MLS draft picks, but so does the conference. Should this year’s squad match last year’s visiting playoff spot, they will have done well.